First of all, it's much too early for me to speak about. My heart is truly broken. And I know, normally I don't speak about sports on my blog because I think by and large people who read blogs hate sports. Suffice to say, yesterday my team lost and it was the game that would have taken us to the Superbowl. So instead let us discuss what we ate, which was mostly a success, thank goodness. 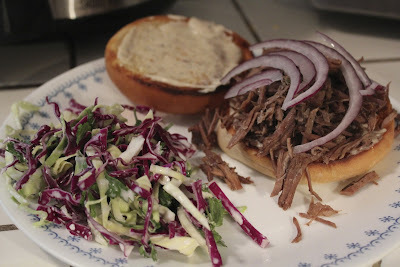 We had shredded beef chuck roast sandwiches (recipe from Everyday Food Dec. 2011) and cilantro slaw (Pioneer Woman). 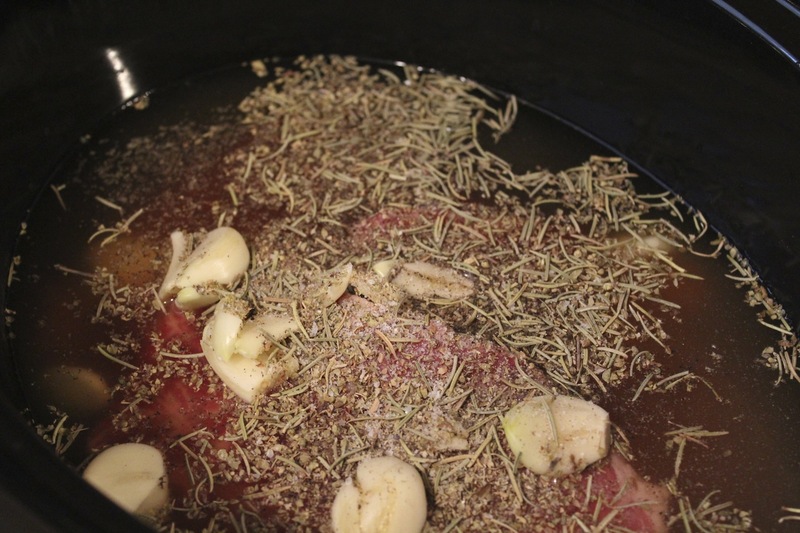 Now for starters, this shredded beef chuck roast recipe is really, really good. It might be the second best thing I've ever made in my crock pot, right after tikka masala. What gives this recipe bonus points, though, is that the recipe is super simple, the way a crock pot recipe should be. 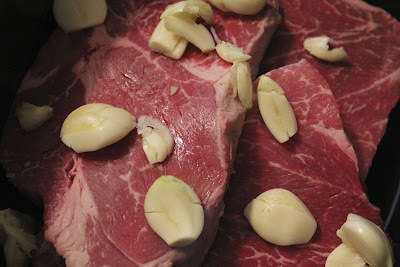 First you take your chuck roast and you throw in a head of garlic. Yes, an entire head. For godssakes, don't not throw in an entire head. Then you throw in some beef broth, oregano, rosemary, salt and pepper. Then you turn it on HIGH for six or seven hours. Ok, here's where the slaw entered the picture. I gotta say, Pioneer Woman has skunked me on a few of her recipes. I'm thinking she and I have different palates. Her burgundy mushrooms? My whole family hated them. There are other recipes of hers that I've tried and my husband usually doesn't like them. I'm thinking that after this slaw recipe, I may need to call it quits on PW. I started out with half a head of green cabbage and half a head of red cabbage, shredded. To this mixture I added lots of milk, mayo, sugar, vinegar, salt, and pepper. And cayenne, which gave it a weird spicy kick. In the end it was a soupy, weird-tasting mess. My husband said it tasted like Play-Do. So let's just focus on the good stuff. These buns are from Whole Foods and they are the BEST buns in the world. 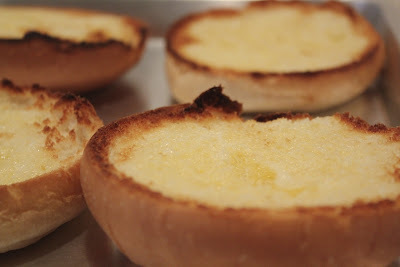 I spread butter on them and put them under the broiler in the oven. Then I spread on horseradish sauce. I think horseradish is key. 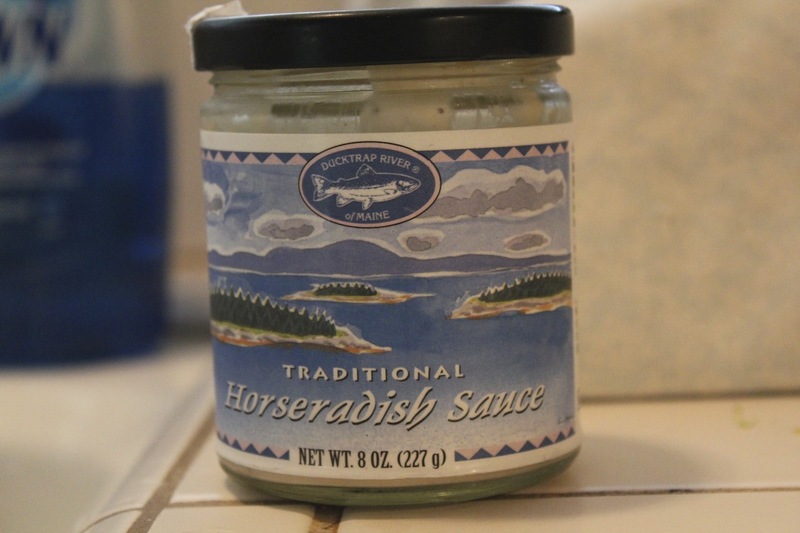 If you prefer, you can just mix a little pure horseradish with some mayonnaise. Or if you hate mayo you could use sour cream or yogurt. 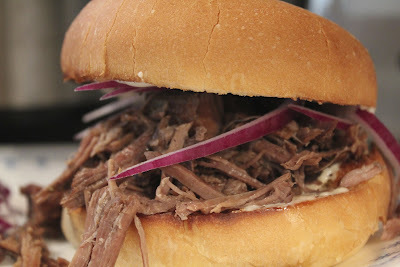 Then all you need is the meat and some thinly sliced red onions. It's truly, truly good. AND, the leftover broth makes a really delicious a jus, if you're into dipping. I'm into it. I dig it much. The true star of the evening yesterday. Thank you, sandwich, for being there for me. I know I can count on you. For the recipe for the shredded beef, visit this link. 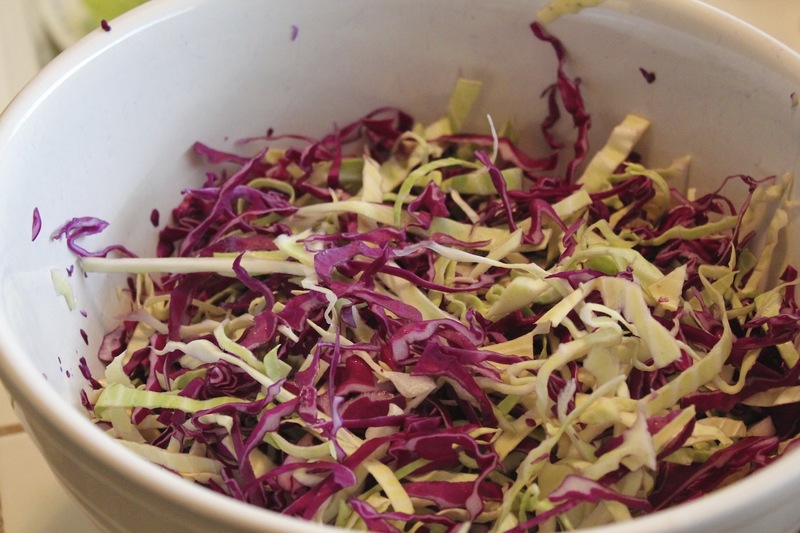 For the recipe for the slaw (but you've been warned), visit this link. For the recipe for the coleslaw that I should have used yesterday, visit this link. I've made this one several times and it's the bomb. Looks delicious! We watched the game with beef stew. I tried the Pioneer Woman's Pig Cake recipe and it turned out like a soppy travesty. Never trust anyone with a face made from Silly Putty. Tilte - Not surprising. I think I'm over her.